GRAND FORKS, N.D. - Linemates Johnny Gaudreau, Pat Mullane and Steven Whitney accounted for nine points - four goals and five assists - and goaltender Parker Milner made 22 saves to lead fifth-ranked Boston College to a 6-2 win over third-ranked North Dakota for the 2011 Ice Breaker Tournament title before 9,420 fans at Ralph Engelstad Arena. "There are six trophies available to us this year," head coach Jerry York said. "We got the first one. It's kind of a stepping stone - they all get bigger as the year goes on." Gaudreau, a freshman, tallied a game-high four points on a goal and three assists while Mullane had a career-high three points on two goals and one assist and Whitney notched one goal and assist. "That line in particular was really dominant on the ice," York said. "Earlier in the season we were trying different combinations and they all seem to move pucks very well. There are a lot of similarities in the way they play." Sophomore Bill Arnold also enjoyed a career night, totaling three points on one goal and two assists while Chris Kreider, who had two points in a 5-2 first-round win over Michigan State, scored his second goal in as many nights and earned the tournament's most valuable player award. The teams were tied at 1-1 after one period on Mullane's first of the season at 2:21 and a shorthanded score from UND's Corban Knight at 15:55. The host Fighting Sioux took a 2-1 advantage with a power-play goal at 5:23 of the second before the visiting Eagles scored four unanswered goals - on eight shots - in just more than 10 minutes goals to take a 5-2 lead into the second intermission. After Kreider tied the game at 2-2 at 7:27 of the middle period, Gaudreau put BC up for good on the power play at 13:16, finishing a sharp feed from Arnold in front of the net for his first collegiate score. The 5-foot-8, 150-pound freshman then fed Mullane in front of the net for his second goal of the night to give BC a 4-2 edge at 16:05. Arnold scored his first goal of the season at 17:14 to conclude the second-period scoring. Whitney tallied the game's lone goal of the third period at 15:15 for the 6-2 final. Milner made 22 saves in the winning effort to improve to 2-0-0. "He was very solid in goal," York said. North Dakota's Aaron Dell made 10 saves on 15 shots in 37:09 to take the loss. Senior Brad Eidsness stopped seven (of eight) shots faced in the final 22:46. North Dakota tallied a slight 24-23 edge in the shot column. Both teams finished 1-for-6 on the power play. 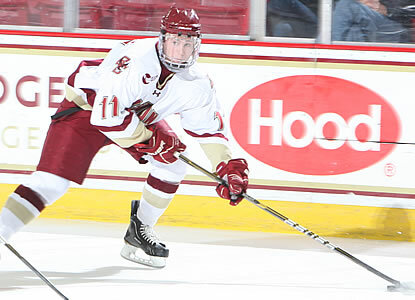 Next, Boston College will host Denver on Friday, Oct. 14 at 7:30 p.m. The game will be televised nationally by CBS College Sports. Game Notes: Milner, Kreider, Arnold and defensemen Patch Alber and Tommy Cross each earned Ice Breaker All-Tournament honors ... BC improved to 4-0-1 against the Fighting Sioux in the last five meetings and evens the all-time series at 11-11-1. BC is 7-3-1 against North Dakota under Jerry York ... BC last scored four times in a period - the second - in a 6-0 home win over Vermont on Nov. 28, 2010 ... BC gave up four shorthanded goals last winter while scoring a national-best 13 itself.